It is a regular night, you are fast asleep, everywhere is quiet and dark, when suddenly you are woken up by the sound of breaking glass, or utensils dropping from their places. The next thing you hear is four paws scampering around, running for cover. The noise you just heard can only be coming from one place, the kitchen. A quick glance at the clock tells you its 2 in the morning. The thought of having an extremely clumsy burglar in your house doesn’t cross your mind, because you remember you might have a kitten or two. It is most likely your cat deep in another episode of the midnight crazies. You might believe you are the only cat owner that experiences this but this couldn’t be farther from the truth. Other feline owners suffer almost every night from these nocturnal rampage episodes. A couple owners have reported experiencing this at least a couple times a week. There is a lot that goes into the “midnight crazies” which include your cats running wildly from one room to another for no conceivable reason, pouncing on the toes of those in the house, batting and pawing at small objects that make noise and even perhaps, tormenting the family dog if there is one. 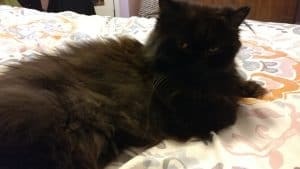 Nevertheless, there are a couple of methods to manage the nighttime antics of any cat, which can be wonderful news for everyone that is sleep deprived in the household. In this article, we shall be taking a look at some of the reasons for cat night crazies and how you can deal with it effectively. Felines are typically nocturnal which means it is just following a natural instinct to be up and active during the night. This is even truer when you consider that the cat’s natural prey is usually also up and about, the cat could just be brushing up and refining its hunting skills, entertaining itself and practicing its fighting skills. The cat would prefer to spend it is playing its part as the predator and hunt even if it is constantly fed by its owner. Numerous cats typically spend the daytime alone while their owners are either at school or work, which means these cats are not getting adequate activity and stimulation during the day. A cat’s day typically begins once everyone in the family is at home. However, the midnight crazies usually tend to occur in young cats that have an extra amount of energy and are too young to know any better. This could also happen to a kitten that was just rehomed, and it is still adapting to living in the house, so it doesn’t yet know that sleeping at night is required. Humans, on the other hand, are diurnal, which means we usually go to sleep at night and remain awake during the day. The goal here is to recalibrate the cat’s sleep cycle to mirror a sleeping pattern that is similar to yours. It could be that your cat is too nervous or anxious to lay down and fall asleep at night, but there are ways you can help it feel a bit more secure by staying with it for a bit, embracing it closely and also petting the cat gently. Some cats can also be comforted by sounds coming from a low playing radio that has been tuned to a soft music station or a talk show. Some other cats are consoled by having a blanket or a toy from the nest they were at prior so that they have the scent from a familiar place present when they want to sleep. As soon as the kitten has been comforted, you are then able to place it in its own bed and reward it when it stays there. Playing with your feline in the evening just before bedtime is another great way. The most suited toys are the fishing pole and laser light toys, as they encourage your cat to do a lot of jumping and running. Doing this increases the cat’s activity levels to the point where it is tired out and is able to fall asleep for the night. Doing this enables the cat to see the outside world, keeping it engaged so there is less reason for the cat to sleep during the day, for fear of missing something exciting. Owners are able to buy a regular perch that can be used as a hammock or a shelf which can get attached to a window ledge. Cat owners can also get a cat window bow which is kind of like a cat solarium; this fits flush into window jams of double sash windows. The two options enable the cat to watch the outside world, observe butterflies, squirrels, birds and much other wildlife present in the environment. It is best to get birdfeeders that are able to be attached to windows via suction cups as they are quite renowned with indoor felines. These birdfeeders keep the attention of these indoor cats for hours. If a suction cup birdfeeder is not available, a standard one can be hung near a window that the cat sits and stares out from. Offer numerous scratching posts, especially as felines enjoy scratching to ensure their claws are kept in tip-top shape. The type of scratching post depends on the cat; as certain cats love a vertical scratching post and other prefer horizontal ones. It is best to have both types present. It is also imperative to make sure that the post is at least one and a half times the length of the cat and are quite sturdy to withstand any roughhousing. Provide areas for the cats to hide. Open cardboard boxes are superb for games of hide and seek. Cats typically prefer to rest and live at heights, so it is best to provide numerous areas with different elevations within the home for the cat to view the world and its movements or to take a nap. Cats naturally prefer to drink running water which is a reasonable distance away from their source of food, so buying a water fountain made for cats can be a good way to enrich their surroundings. Should the cat be an indoor cat, it is best to think about buying an outdoor enclosure that helps excite your cat during the day when you or any human is unavailable. If there are plants present in the enclosure, it is best to ascertain if they are not dangerous to cats as some widespread household plants like lilies are actually quite toxic to felines and could cause fatalities. You could consider purchasing cat grass or a catnip plant to offer additional entertainment. It can be good to attempt to anticipate any mischief the cat might get up to in the odd hours of the night, while everyone else has gone to sleep. Storing garbage pails, lamp cords, kitchen glassware, computer keyboards, clothing, and books away before heading to bed is something that should be done. Any pet parent will tell you that if your cat succeeds in waking you up to feed it in the middle of the night just once, you can bet it’ll expect the same thing every night. It is best not to start a routine you don’t want to happen. 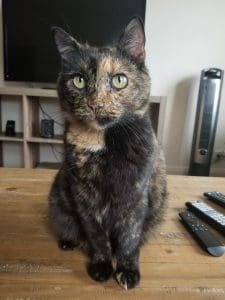 If you have already begun to do this and you think your cat is set in its ways, the truth is you can still change this routine can still be changed. The first thing to do is to feed your cat closer to bedtime, perhaps before the traditional rigorous pre-bedtime play session. It is best to have a smaller portion of meals during the day to avoid overfeeding your cat. This solution is great if your cat is the sole cat in the household, as adopting a companion would decrease the boredom and increase activity levels of the cat during daylight hours. All nocturnal play would then be directed towards the other cat and away from you or any other item in the house. Should the cat become extremely destructive or boisterous at night, it might be necessary to confine the cat to the bathroom or an extra room for the night. It is imperative to ensure the cat has adequate space to move around. Food, water, a scratching post, and a litter box should be provided. It is best to not give in and let your cat out once it begins whining or crying to be let out. Should you do that, you have just rewarded the negative action of pawing at the door and vocalizing. This sends a signal to the cat that it can do those things and soon enough it would get its way. If the cat is allowed to sleep in the bedroom or is allowed to have unfettered access all over the home at night, it might be necessary to get a hairdryer or a spray bottle that is placed by the bedside, so that when the cat attempts to wake you up by pawing at your feet or face or meowing, you are able to reach for the spray bottle and spray some water at it or, the hair dryer to blast some air at its direction. These actions don’t injure the cat; however, it startles and discourages it from repeating the offending action. It is important to note that expecting your cat to sleep all through the night when it hasn’t been trained or it hasn’t been tired out through playtime is unrealistic. It is best to note that cats require sleep and recreation, same as humans. The aim here is to coordinate your schedule with the cat so you are both happy and fulfilled. It might be smart to purchase an automatic feeder to feed your cat in the event that it keeps crying at 3 in the morning for food, with an urgency that states it can’t survive till daybreak. The automatic feeder will provide small portioned meals at intervals that have been programmed. In the event the cat wakes you up by scratching or pounding at the door, it is best to place down an electronic cat mat, a carpet runner placed upside down or sticky tape on the floor just outside the bedroom door. There are many reasons why your cat might be acting crazily at night, but before jumping to conclusions it is best to speak with a veterinarian as it is imperative to rule out any medical issues that have been plaguing the cat to cause the nocturnal activity. Glandular issues such as thyroid disease and pain can be an underlying cause of cat night crazies. If there are no underlying issues, the next step is to gradually change the schedule of the cat to manage the energy levels the cat has at night. This can be done by encouraging more playtime and feeding in the day till early evening hours. This would make the schedule of the cat closely resemble that of humans. PreviousPrevious post:Why Do Cats Follow Us Into the Bathroom?NextNext post:What Does Erratic Cat Behavior Mean?